Strap yourselves in and prepare for lift-off as we offer you a list of four cosmic themed films that are positively out of this world. A highlight of Montreal's Expo 67 was certainly the creation of the Labyrinth Pavilion by the NFB. Come and take a look inside! Explore the Universe with the NFB! Filmmakers have always been obsessed with exploring the cosmos and the science of space. Enjoy five films about the secrets of our vast universe! Get some juicy behind-the-scenes info straight from Oscar®-nominated animator and filmmaker Gerald Potteron about his illustrious career—and watch a few films, too. Potterton worked with Buster Keaton, Ivan Reitman, Colin Low, and even on The Beatles' "Yellow Submarine" in his decades-long career. 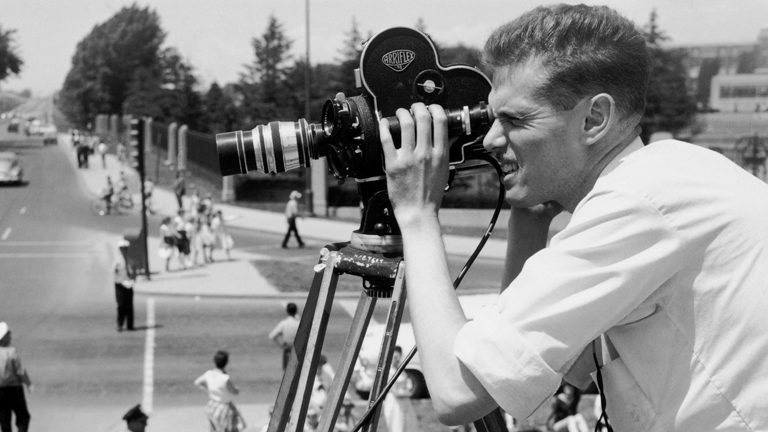 Explore the life and work of Canadian filmmaker, producer, cinematographer, animator, and overall cinema pioneer Wolf Koenig. This week on NFB.ca, take a trip through the genesis of the Canadair Challenger jet, and the film that tells this ambitious airplane's story. Did you know that "Universe", a 26-minute masterpiece on astronomy by Colin Low and Roman Kroitor actually inspired Stanley Kubrick's 2001, A Space Odyssey? Watch "Universe" now!